Mixing prints in the summer time is so fun! I love mixing cute patterned tees with fun shorts. This look combines a stripe print along with an adorable palm tree tee. These striped chambray shorts are patterned but they are a great neutral piece that practically go with anything. To pick up more chambray in the look I wore my J Crew Sperry Topsiders that are made of a light chambray material. I love these Sperry's because they have small embroidered anchors on them which make them the perfect shoe for summer. To accessorize this look I stuck with gold accessories. I wore a simple gold belt, a whimsical statement necklace, along with my Alex and Ani bangles. In addition I wore my KJP pearl bracelet to add an extra nautical touch to the look. 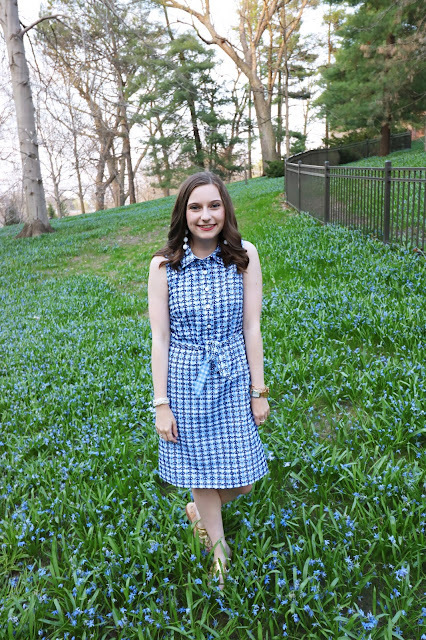 How do you style chambray in the summer? Let me know in the comments! Yesterday was National Wear Lilly day aka the first day of summer! For the special occasion I kept things casual with this Lilly for Target blouse. My actual Lilly dress is very formal so it wasn't exactly made for a lazy day and seeing a movie. For a casual movie date I wore a pair of dark wash jeans and this adorable Lilly for Target blouse. I always wear jeans when going to a movie theater because they are always freezing! Even if it is super hot outside I highly recommend bringing a sweater or jacket into the theater to keep you warm. To complete the look I wore my Jack Rogers sandals and stacked bracelets. What did you wear on National Wear Lilly Day? Let me know in the comments or leave a link to your blog post! There is nothing better then the Fourth of July! From BBQs to red white and blue it doesn't get any better. For the 4th most people bust out their best patriotic wear and dress for the occasion. Whether you want to dress fancy or casual here are a few pieces to take inspiration from for your 4th look. From Jack Rogers to Rowdy Gentleman tees you can't go wrong with any of these pieces for your 4th of July look. 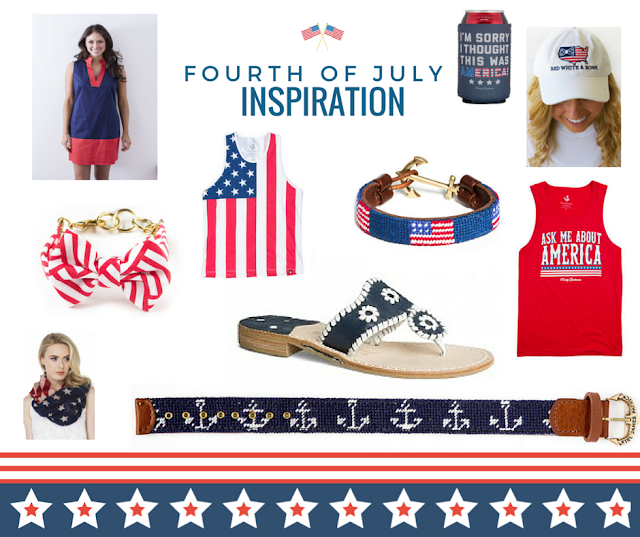 What will you be wearing on the 4th of July? Let me know in the comments! Friday was my 20th birthday! The day was filled with friends and family and a lot of food. To start off the day I went to breakfast with my friends Mariah, Maureen, and Cathleen at my favorite local spot. Then Mariah and I got massages at my chiropractor office for a little relaxation. After that we got ready and went shopping downtown Naperville. We scooped up a few great things from J Crew, Sephora, and Anthropolgie. Then we completed our shopping trip at the Victoria Secret semi-annual sale! P.s. currently their sale bras are an extra 25% off in stores so go hit that up! After spending too much money we got dinner with my family, my two aunts, Mariah, and Maureen. We ate at one of my favorites On the Border. When the waiters sang to me they wished me a happy 21st birthday. The rest of the night we joked that I turned 21 instead of 20! It was nice to have dinner with my friends and family and to celebrate another stylish year. For my birthday look I wore this adorable lace romper I just picked up from Francesca's. It was on sale for around $25 which is a pretty good deal. It has a v-neck and a lower back with thicker straps. I paired it with a bold statement necklace from Baublebar which I picked up from the Nordstrom anniversary sale last year. To dinner I wore BCBG heels but to go around town and shop I wore my go-to sandals of the moment. I am obsessed with these rhinestone sandals from Target. For only $22 they are a great deal! Today is my 20th birthday! Yay! This weekend I will be celebrating, eating a lot of food, taking Instagram pics, and doing some shopping with my friend Mariah from Chambery and Champagne! But, here is a list of things I'm loving that I would include on my birthday wishlist. Does anyone else have a summer birthday? What is on your wishlist? Let me know in the comments! The weather in Illinois has been super wacky. It will go from hot, humid, and sunny to pouring rain, humid, and pitch black. So, it's hard to get up and dress for an unpredictable day! But, when I left the house it happened to be nice and sunny. Naturally I had to take advantage of the sun! For this look I wanted something that was light and comfortable. Humidity is not my friend. I wore this light white collared shirt to keep things simple. By adding a bright printed short I spiced up the simple top. I also love this top because it has this built in tie which is something I have been loving to do with my collared shirts. To accessorize this look I wore a bold pink statement earring. This pink statement earring from J Crew is one of my go-to pieces when I want to add a touch of color. I also wore my favorite Alex and Ani bangles along with a tassel bead bracelet from Armed and Readi. To finish the look I wore my go-to watch of the moment from Henri Bendel. I LOVE these Sperry Topsider sneakers. They have adorable leather ties that make them a little different from your average sneaker. Plus they go with everything. As many of you may know I scooped up a bunch of stuff from the Lilly for Target collection. These shorts I snagged from the kids section. One of the many perks of being short/ tiny is that you can get really cute clothes in the kids department for the fraction of the cost. What is your go-to look when the weather gets humid? Let me know in the comments! Pura Vida bracelets are a huge must-have accessory for the summertime. They are light and stackable but also give off that summer vibe. Although I wear them year round I feel like these bracelets were made for the summer! These bracelets are not only stylish and cool but they also have a great message behind them. All Pura Vida bracelets help benefit jobs for people in Costa Rica. Awesome right? If you are interested in adding some Pura Vida bracelets to your summer stack be sure to use my coupon code POLLITT10 to receive 10% off your order! Do you have any Pura Vida bracelets? If so which colors? Let me know in the comments! ATTENTION! Alex and Ani is currently having an awesome sale on their website. Not only do you get select items at 30% off but they are donating 15% of the proceeds to charity. So, you can not only shop some fabulous bangle but also help those in need. As many of you may know Alex and Ani bangles are my absolute favorite! I have a lot in my collection, mostly featuring Disney styles. But, I wear them everyday and they are a great stacking piece to have in your arm party. Here are a few of my favorite bangles that are on sale now! Now get shopping! What is your favorite Alex and Ani bangle? Let me know in the comments! Recently I was sent the Zakia Morocco face and body mask to try out. I will say this is one unique face and body mask! This mask is made from 100% pure and natural clay which is mined in the Atlas Mountains of Morocco. You can not only use this mask for your face but also it works in your hair. This mask is the ideal component to have a perfect spa day. Whether you have some me time or host with friends this mask is a great beauty item to add to your collection! By mixing water with the powder one creates a mask to use on the body, face, or hair! Keep the product on your skin for 10 minutes to reveal soft skin! It also helps absorbs unwanted grease, removes facial impurities, and erases blackheads! This product is great because it is three in one. You can use it for hair, body, or face which is great if you are looking for a dual purpose product. Does this mask seem interesting for you? Feel free to use this coupon code for 20% off any products in their store! Zakia Morocco Ghassoul Clay Powder (face and body mask) | As I mentioned before this product is the perfect product for a spa day! Just by adding water you can create a hair, face, or body mask with just one product. Scented candle | Scented candles are the best kind of candles! My favorite are Capri Blue candles. You can find these at Anthropologie or at other retailers. Spa headband | To keep your hair out of your face when applying masks be sure to wear some sort of headband and tie your hair back. Calming playlist | Create a playlist featuring soothing songs. Pick whatever makes you feel most relaxed. Bath Bomb | The best place to get bath bombs are from Lush. These are not only fun but also release amazing scents that are out of this world. What is your favorite face or hair mask? Let me know in the comments!